Over the last few days, I have managed to get PearPC running somewhat decently on an AMD64 machine at work. It is still very much choppy, but it seems that the processing speed is decently fast. The screen updates are set in the config file to a constant 200ms, so it is no surprise it is unsmooth. But I'm told some things execute marginally faster than on a first-generation 300MHz iBook. Not bad for a program that has to do byte swapping and native instruction translation. The kind of success that PearPC has achieved is exactly what the goal of the first open-source project I was involved with, vMac, was. Long before the times of SourceForge, our project could execute at over half of the speed of a Mac Plus when executing on a Pentium 200 or so. The difficulty was always in the fact that old MacOS relied very heavily on its ROM, as large as 4 megabytes on late m68Ks and early PPCs. There was always much legal debate surrounding the issue as well. I am glad to see that PearPC and MacOSX apparently do not have to rely on this. 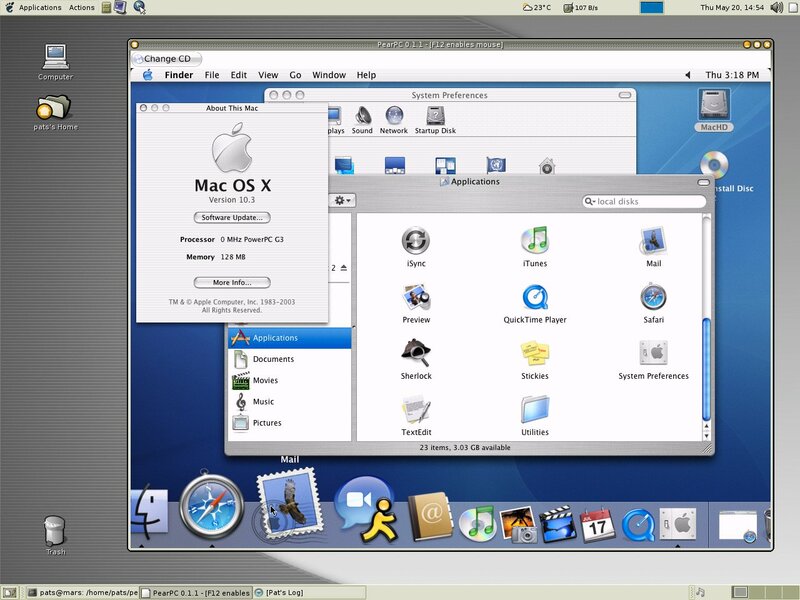 At some point, it may be worth trying PPC Linux on this emulator, but for now it is an old dream come true seeing a 'late model' MacOS running under non-Apple hardware. With time, it will only become more optimized. The other possibility is a cease-and-desist letter from Apple; hopefully the former. In other news, the backlight on the new camera flickered and died last night. The store happily replaced the unit. The symptoms were that when the lens retracted, it hit the screen from behind producing an effect much like pressing on an LCD with a finger. Suspicions aside, it is nice to see the new one not doing so. This Casio QV-R40 is certainly a good unit.